The University of Toronto law professor co-founded Blue J Legal in 2015, using machine learning algorithms to predict the likely outcomes of future tax law cases. He focused on tax law because it was his area of research expertise and represented a potentially huge market. It wasn’t long before Alarie and his Blue J Legal team, including fellow co-founders and Faculty of Law faculty members Albert Yoon and Anthony Niblett, realized that broadening their scope to include another practice area would make Blue J Legal that much more useful to its target customers. So, in late November, Blue J Legal officially launched its Employment Foresight tool. As with its original Tax Foresight product, Blue J's machine learning algorithms scan thousands of judicial decisions and detect patterns, both obvious and hidden, in the rulings. The findings are then used to predict how a judge is likely to rule based on a given set of facts, and provide lawyers with the relevant cases to review. That's in stark contrast to how lawyers currently operate. Most rely on a handful of “leading” cases and their professional experience when trying to gauge the probability of succeeding in court. “It’s one of those things you do as a startup,” Alarie says. “You start off building something, and then you listen very attentively to the market about what would be interesting and solve real problems for people. One example of a perennially difficult employment law question is how much notice must be given to employees who are about to be laid off – an unfortunate circumstance that affects about 800,000 Canadian workers each year. The answer depends on a number of factors, including the specifications of employment contracts, applicable statutory requirements and an understanding of how courts have previously ruled in similar circumstances. Alarie says the potential customers for Employment Foresight are both law firms and employers themselves. 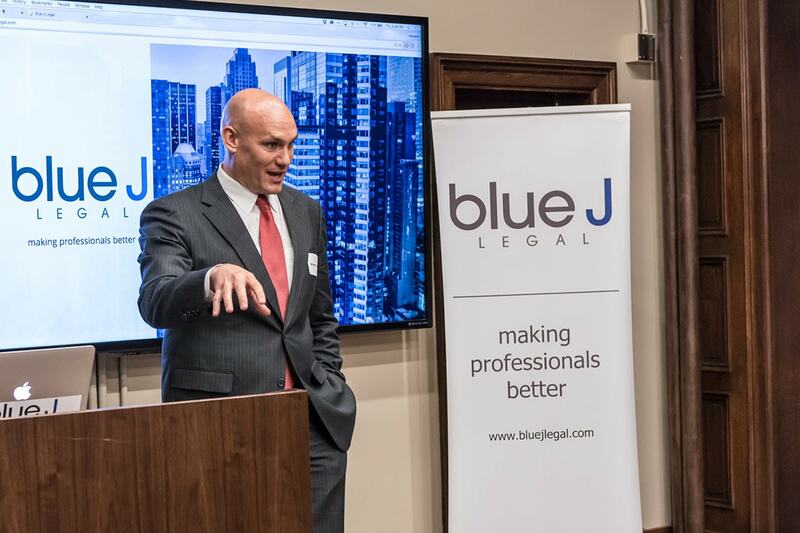 Blue J Legal got its start after Alarie was asked to judge an IBM Watson competition at U of T that helped launch ROSS Intelligence, another startup that's using AI to improve the way lawyers search for cases. Blue J Legal has worked with U of T's Creative Destruction Lab and UTEST – two of the many entrepreneurship hubs on campus. Alarie says his goal is to eventually expand Blue J's AI prediction technology to all areas of the law. He predicts AI technologies like machine learning will dramatically reshape the profession by making the practice of law far more accurate and efficient, if significantly more complicated. “This is about making the law work better,” he says.